People from Shelton who need gum disease treatment can now visit Dr. Richard Amato for the LANAP® protocol, a laser-based gum disease treatment. This minimally invasive laser gum surgery treats periodontal disease while eliminating many of the undesirable effects of more invasive treatments. Dr. Richard Amato is now accepting patients from Shelton who need gum disease treatment to his practice in Monroe. Dr. Amato is among a small number of dental professionals who offer patients the advanced, minimally invasive LANAP® protocol, which is an FDA-cleared laser gum surgery. This procedure removes periodontal disease while minimizing bleeding, pain, and healing time. Many patients find the LANAP® protocol appealing next to traditional gum surgery because the procedure is minimally invasive. Dr. Amato does not have to cut or remove any healthy tissue, and he does not have to place any sutures at the end of the procedure. Since the surgery is minimally invasive and since the laser has a sterilizing effect, the risk of complications such as infections is low. In addition to these benefits, laser gum surgery helps preserve teeth and gum tissue. The procedure causes minimal tissue loss or damage, and it can reduce the risk of teeth being lost by stimulating regeneration in the bone that anchors the teeth. Dr. Amato can complete the procedure in a few simple steps. First, he measures the depth of the patient’s gum pockets. Next, he uses the PerioLase® MVP-7™, which operates at a wavelength that kills bacteria and removes diseased tissue. After using a hand tool to remove tartar deposits from below the gumline, Dr. Amato uses the laser a second time, to stimulate bone growth and form a blood clot around the surgical site. When the laser gum surgery procedure is complete, most patients experience little bleeding or discomfort. Many people can return to their usual routines the same day after visiting Dr. Amato for this gum disease treatment. People who notice symptoms such as bleeding, swelling, redness, or tenderness can benefit from scheduling a consultation with Dr. Amato. Many people focus on the immediate effects of gum disease — which can include tooth loss, gum recession, and even bone loss — but periodontal disease can also have effects on general health. The condition may cause chronic inflammation, and it has been associated with a higher risk of health problems such as heart disease. In light of these harmful effects, Dr. Amato encourages patients from Shelton to take warning signs of gum disease seriously and not delay seeking gum disease treatment. Dr. Richard Amato is a Periodontist and Dental Implant Specialist who provides the most advanced technology for his patients in Monroe, Connecticut. He has placed thousands of dental implants since 1989. Dr. Amato graduated first in his class with a DDS degree from Stony Brook University. Dr. Amato then completed a full time multi-year specialty residency and received his Certificate of Proficiency in Periodontics from Eastman Dental Center at the University of Rochester. He is part of one percent of dental professionals in the USA providing the LANAP® FDA cleared laser procedure for gum disease treatment. Dr. Amato is the first and most experienced dentist to provide LANAP® therapy in Fairfield County Connecticut. 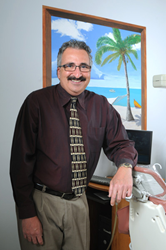 To learn more about Dr. Amato and his dental services visit his website at http://www.connecticutperiodontist.com and call (203) 712-0917.